The labor crisis at water and wastewater utilities across the U.S. is well documented, but answers to the problem — a graying workforce retiring en masse, resulting in both physical vacancies and knowledge gaps to fill — are much harder to find. While long-term recruiting efforts have been developed by, among others, the American Water Works Association and the Water Environment Federation, the ‘next generation’ of talent cannot address the very immediate concerns of short-handed utilities, and sometimes the need is merely temporarily. As new technologies are introduced at treatment plants, for instance, there may be demand for certain expertise to help with startup and training. Who fills this void, or who can come in and knock out shifts at the plant on short notice for a short term? The answer is licensed, experienced operators who can commit to your job, but only to the extent that you need them. The next question: How do these entities — the needy utility and the hired hand — find each other and ‘make it work’ legally, logistically, and otherwise? 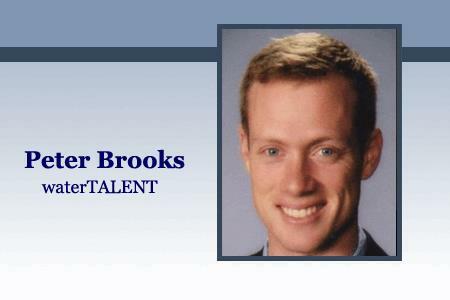 This is where waterTALENT and Peter Brooks, the company’s vice president, come in. Much in the way that Match.com links people romantically based on their personal profiles, waterTALENT finds the right person for the right job and can put them to work right away. The following Q&A provides detail on the innovative labor solution, which amounts to a win-win-win for operators looking for extra pay, utilities in a pinch, and the communities they serve. What is waterTALENT and what need does it fill? waterTALENT provides highly qualified, licensed, and insured water and wastewater professionals for short-term assignments to assist water districts, municipalities, and industrial water users with a wide range of needs. Our operators provide support across a range of demands including supplemental staff support for transitions due to a retirement or other vacancy; new plant commissioning, troubleshooting, and startup support; and providing emergency response support. to provide operators and experts an opportunity to expand their careers and experience by serving in a new working environment and system. The entire water industry is undergoing a massive transformation as the Baby Boomer generation retires at precisely the same time that our water and wastewater systems are showing great signs of age and our water sources and natural systems are under greater strain. We saw the need to offer a platform for the best operators to help support water and wastewater utilities as they flex through this time of transition. What specific labor services are offered? What are some representative job titles within your talent pool? Our main focus is on licensed water and wastewater operators, but many of operators have backgrounds in other fields like engineering (PE), finance, construction management, environmental compliance, building inspections, supervisory control and data acquisition (SCADA) programming, and others. They’re also experienced across a range of treatment trains, from small conventional plants to large multi-barrier treatment plants with membranes (e.g., ultrafiltration [UF], microfiltration [MF], nanofiltration [NF], reverse osmosis) and advanced disinfection (e.g., UV, ozone, advanced oxidation, granular activated carbon) technologies. Because of their range of skills, our operators are also asked to support a number of other requirements including: design and specification review with the “operator’s perspective”, operational audits, plant startups, environmental compliance reviews, preventative maintenance plans, and even plant redesigns. Our operators provide a range of services for jobs ranging from Relief Treatment Plant Operator all the way up to General Manager and Public Works Director. Our primary industries are the owners and operators of water and wastewater collection, distribution, and treatment facilities, be it public utilities, investor-owned utilities, or contract operators (which we are not), but we are also working more and more with engineering firms and contractors who are responding to bids with the stipulated requirement for licensed water or wastewater operators to assist in plant startup and commissioning, but don’t have a licensed operator on staff or don’t have the desire to hire one full-time. How do operators qualify or get certified for waterTALENT? Where do they typically come from (i.e., retired, out of work, “moonlighting”)? As a starting point, all of our operators hold current state licenses or certifications for their relevant area of expertise. From there, every operator goes through a rigorous screening process including a full background check, drug test, work history review, multiple reference checks, and then finally we have our operators complete a 147-point skill review that allows us to map out their areas of expertise to have them assess their own confidence in a particular skill. We have sophisticated, custom software that matches a particular operator’s skills and background with a specific client need: water or wastewater, distribution or treatment, junior level or senior level, etc. We welcome applications from all qualified water professionals, but we don’t accept everyone into our deployable pool. Many of our operators are recently retired and are still active in the industry and looking for more opportunities to continue to serve water and wastewater utilities. The remainder are professionals with full-time commitments, but have flexibility in their schedules who may (after clearing through their chain of command) take some short-term shift work with us. As it turns out, these operators are often less interested in having just another income stream and are more motivated by sharing their expertise in a new setting. Working in a different system can also allow our operators to put some hours towards earning a more advanced certification, to learn a new treatment technology, or to learn a different way of running a maintenance program. We see our role as both solving our clients’ problems as well as helping operators advance their careers and professional development. How does waterTALENT insure (and ensure) the work they offer — for both the contracted employee and the client acquiring service? We’ve heavily invested in our insurance, liability, and workers compensation coverage for a few reasons: first, the old way of doing temporary staffing where a water district hires a local, retired operator using a simple 1099-Independent Contractor contract leaves the water district or company open to a lot of risk. It might make sense for an IT professional or an accountant, but for higher-risk jobs like wastewater treatment plant operators, it leaves the plant owner at risk in the event that there’s an injury or accident that could result in a co-employment situation, which could be a long-term cost they would rather avoid. All of our operators are in fact W2 employees of waterTALENT, not 1099 contractors. Second, we’re seeing from the tragic example of Flint, MI, and other water quality challenges around the country that our water and wastewater systems and the people operating them are coming under greater scrutiny, and rightfully so given the important role they play in protecting public health. We see our level of coverage, which is a $5 million unencumbered general liability policy, on top of auto, professional, and employment practices liability coverage in addition to workers’ compensation, as the new industry standard. That gets a bit more in the weeds than most plant operators are concerned, but human resources managers, attorneys, and risk managers are generally relieved when they hear about the level of coverage we provide for all of our operators. In terms of ensuring that our operators are doing their job to the client’s satisfaction, we spend a lot of time matching the right operator with the right assignment. Our back-end algorithms help match for the on-paper traits, but then we always screen for personality fit and allow for an interview and references before the client makes the decision to deploy one of our operators. Then, throughout the deployment, we maintain regular contact with both our operators and our clients. If at any time the assignment isn’t a good match for the operator or the client, waterTALENT will work to identify a similarly qualified candidate to fill the role. How is payment negotiated and handled? We charge an hourly rate that covers the full cost of the operator’s time, workers’ compensation, liability coverage, and other direct costs including mileage, meals and incidentals, and mobile phone (we require all of our operators to use our mobile, location-based app to track their hours and compliance). All of our operators are at-will, so clients aren’t stuck with a contract with a fixed duration if, for example, the client is able to find a full-time replacement sooner than expected. Rates are competitive and based on the skill and level of responsibility required, and the hourly nature of the charges also allows the client to throttle down or up the number of hours per week depending on workflow demands and budget available. Overall, why is the temporary arrangement attractive for the waterTALENT employee and the client? Our operators love the idea and flexibility of the short-term assignment. As I mentioned, many of them have other interests including other full-time or part-time jobs, their own specialized consulting services, operator training programs, or local college teaching positions. For those enjoying retirement, having a discrete ending to an assignment allows them to explore their other career or personal priorities. The temporary nature also allows them to learn from another system or share their lessons learned from experience. This bidirectional knowledge transfer in an environment of mutual respect is one of the ancillary benefits of this kind of interim staff support. For the owner or operator of the water or wastewater system, a licensed and screened temporary employee helps to maintain a system in compliance and operating safely in the event there is an unexpected staff vacancy, without having to wait for the full-time hiring process and with the flexibility to terminate the assignment whenever they want. This means facilities can maintain system uptime without violating regulations while conducting the lengthy recruiting and hiring process for a full-time replacement and to avoid overworking the remaining operator staff. How do individuals and companies sign up, and what happens from there? Operators who are interested in finding work and water and wastewater system owners and operators looking for interim staff relief can both reach out to us through our website or by giving us a direct call. After an initial introductory discussion (with a real waterTALENT human being), we input the relevant data into our system to find the best match based on skills, location, availability, and interest. From there we contact qualified operators, presenting the assignment before presenting the final list of qualified and available candidates back to the client for a phone or in-person interview before finalizing the assignment. Are waterTALENT’s services regional or national? Where are you doing best, and where are you looking to grow? We were founded in California and are focused here, but we are expanding nationwide with work underway from California to Maine and Florida to Alaska. The shortage of licensed, qualified water and wastewater operators is truly a nationwide challenge, particularly with the rapid retirement of the Baby Boomers and the challenge of recruiting new operators into the workforce. All of this is happening in the context of increasing scrutiny and concern related to the quality of our drinking water supplies and the impacts of wastewater discharges to fragile ecosystems. We believe water and wastewater operators are the third pillar of public safety, alongside firefighters and police officers, and ought to be given the credit they deserve for keeping our infrastructure operating safely and smoothly all around the country. One other thing to mention is that waterTALENT and our operators are also supporting the development of the new Advanced Water Treatment Operator certification and license for the new standard for advanced, multi-barrier treatment trains serving potable wastewater reuse application, beginning here in California, but eventually around the country and world. Our operators have deep experience across the treatment trains that are going to be critical to the safe deployment of potable reuse in the future including: UV, ozone, UF/MF/NF, advanced oxidation, biologically activated carbon, and real-time monitoring and control technologies and SCADA systems. We’re excited to support this advancement in the water operator industry and look forward to seeing the results of the efforts underway.